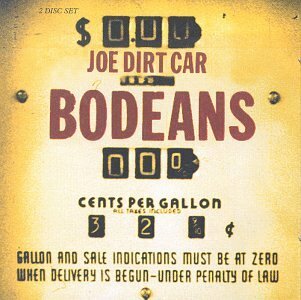 Today’s Cool Album of the Day (#359 in the Series) is BoDeans, Joe Dirt Car. Today we once again take a look at a live album. As you probably know, we only do this on Saturdays. This one is from the Waukesha, Wisconsin band the BoDeans. The BoDeans hit the scene in the mid-80s. They’re still going strong today. They are led by two front men, guitar vocalists Kurt Neumann and Sam Llanas. After those two, it’s been a complete revolving door. It didn’t start off that way. They were a pretty stable band from the start to the early-90s. Bassist Bob Griffin was around for a long time as well. To me, The BoDeans started off strongly. I loved most of their stuff from that early period. I’ll always feel that they did their best work when they had some stability. The more things changed, the more the quality fell off. Having said all that, I kind of always looked at this as the end of the “Good Ol’ Days.” In fact, about three or four years early would have even been better if you ask me. This album is two discs and contains 24 tracks! My guess is that you have nearly a complete BoDeans concert here. You could do that since this was their first live album. Some songs will continue to be played live, but you can’t repeat the same tunes on every live disc. So it’s much easier to make that first live album the full show. Some of those early tracks that I refer to are “Still the Night” and “She a Runaway.” I think my favorite hear is the set opener, “Idaho.” They show off the voices on that one! You’ll also find “Closer to Free” here, plus a couple from maybe my favorite BoDeans album, Outside, Looking In. Those songs being, “Say About Love”, “The Ballad of Jeannie Rae” and “I’m in Trouble Again.” I would have loved to have had this album include “What it Feels Like.” That was a great set opener back in the day. I think it’s dropped off their radar however.